Ethical, original, sustainable and with all the beauty and style that happens when Italians do something extremely well, Davines has become a Cult classic for countless discerning beauty lovers. Brimming with roucou oil – a potent Amazonian extract derived from the fruit of the achiote, which is 100 times richer in beta-carotene that carrots – Davines’s OI Oil helps to stimulate melanin synthesis and in turn, maintain your hair’s natural pigment. Featherweight and non-greasy, this elixir also exhibits a powerful smoothing, detangling and frizz-fighting action, to keep even wild hair types under control. Quirkily cool yet results-driven, Davines’s ‘OI’ range is powered by roucou oil (pronounced ru ‘ku) – a ‘secret’ ingredient beloved by native inhabitants of the Amazon rainforest, who rely on the fruits of the ‘Lipstick Tree’ to protect their hair against the sun and other daily stresses. Intensively replenishing, Davines have harnessed the potency of this wonder-extract to create a range of shine-enhancing, moisture-boosting hair care treatments – suitable for all hair types, these exquisite products are perfect for nourishing, smoothing and ‘controlling’ weakened, dry or tempestuous tresses. For an anti-frizz effect, apply 2-3 squeezes of OI Oil on damp hair, distributing it evenly on the lengths and ends, then dry. For a shiny and soft finish, apply approximately 2-3 squeezes of OI Oil to lengths and ends of dry hair. The quantity can vary according to the hair type: use only 1 pump for fine hair, or 2 - 3 pumps for medium or thick hair (you can apply a bit extra if needed). Very moisturising and easy to use spray for even distribution, very happy. I bought this and the Oi all in one milk and they have been the best leave-in hair products I have ever bought, I use the all in one milk on towel dried hair, blow dry and then once styled I use a little of the oil to add extra shine and reduce frizz. Smells and feels amazing to use, can get a little greasy looking if you use too much product, so I only use 1-2 pumps through mid-lengths and ends. Both products work really well together and cannot recommend enough. This Oi oil is so good! I do 2-3 pumps (from the travel-sized bottle) for mid/long bleached & dyed blonde hair on towel dried hair - after a detangling spray (the Oi milk is brilliant too for that), I rub my hands together and then spread it out, concentrating on the drier bleached parts, before using the Wet Brush to brush through - in combination with a detangling spray & the Wet Brush, brushing my wet hair after washing is so much easier, and I have way less breakage too. It's not greasy, and smells divine (in my opinion) - kind of like a combination of mint and baby powder. It has lasted close to a year, and I use it on mine and my daughters hair (so about 5-6 times a week collectively). With this and the Oi Milk I don't need conditioner.. And for the price your get quite a lot of product. Awesome. I am very happy with this product . My hair are very frizzy and thick and I live in a country with humidity issues :) This is the only product that worked. After applying 3-4 drops (sometimes every morning) my hair were no more frizzy but smooth and silky instead. I have to say, is an expensive product but it's worth it. Very good results. This is the best hair oil I have tried! It has a lovely scent and makes my hair soft and tangle free. I had heaps of frizzy bits that are now smooth and shiny, and the effects of the oil last for days. Very happy with my purchase, I definitely recommend this product! I love all Davines products, and this is great, it smells great, but it is a little heavy for my hair so have to be careful not to put too much in. The OI milk is better for me as my hair is fine. It’s still good though, just need to be sparing and it will last ages. One pump goes a long way. 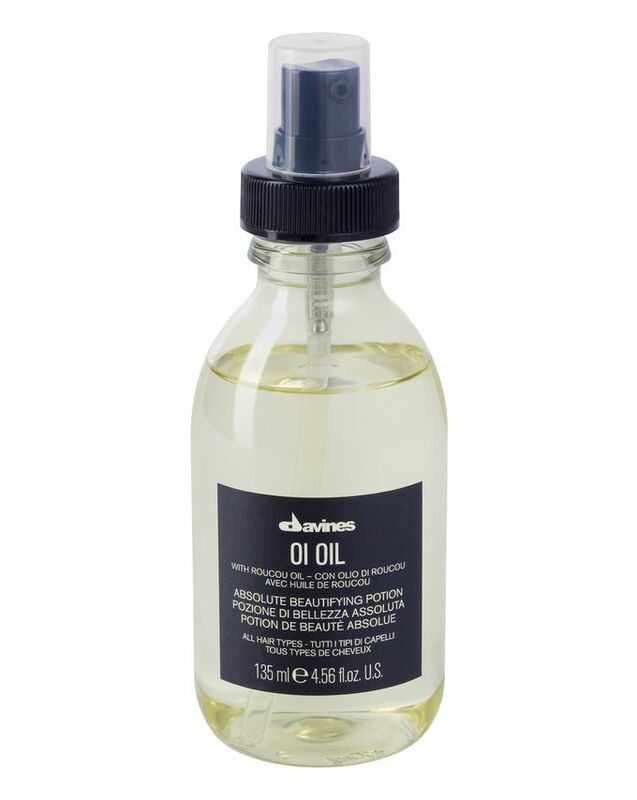 It's a tricky one for me because I love the oil itself, it makes my thick frizzy hair a bit more tamed, BUT the smell of this oil is sickening to me, and even after washing my hand I still feel it. While it probably comes down to personal taste is you would like this smell or not, I don't think a hair product will be better if you pour a bottle of perfume in it. On the positive side, it lasts forever as the bottle is quite big. Lasted me a whole year! I bought this in May 2016, use 3 pumps of it everyday (my little sister steals it all the time too) and I still have a 3rd of the bottle left! Seriously good value for money.